do my comments work? not that I am CLAMOURING FOR ATTENTION or anything, but I've had no comments in the last two weeks and I have been tweaking, so leave me a comment if you can please! If you try and have problems, you can email me on yiduiqie at gmail etc. Our friends J and dB have been away for a few weeks, and before they went they turned off their fridge and freezer, so we ended up with a whole lot of stuff. Amongst these surprises included half a jar of red curry paste and several containers of homemade vegie stock, so I decided to use some of it up by making some red curry noodles. This curry paste had a much sweeter flavour than what I am used to in my curry paste (which I would ordinarily make myself), but the idea is sound! And just this morning, dB and J returned home! What a timely posting. This was really fast and really easy. Quick dinner or lunch idea, I think! 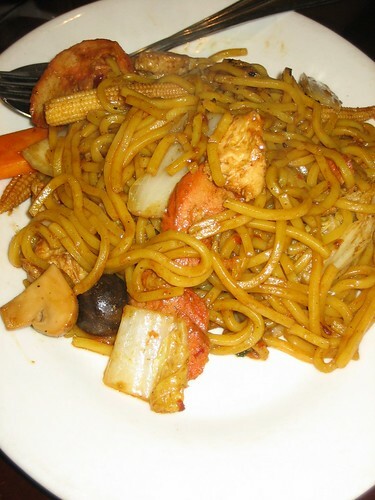 Soak the noodles in hot water for a minute or two, to soften, then drain and set aside. 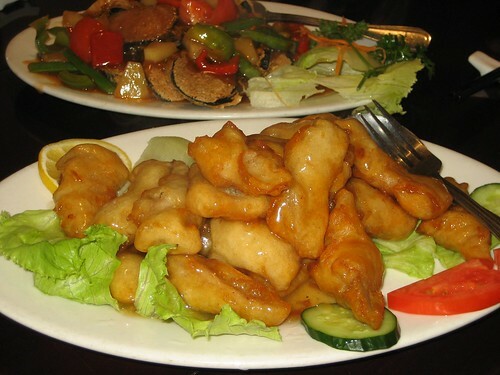 Slice the tofu and fry it in some peanut oil until it is puffy and fried. Set aside. In a wok, throw in the carrot, capsicum, garlic and chilli. Fry in a little oil until the garlic is fragrant and the carrots are softening, then add the lemongrass and the curry paste, then the coconut milk, vegie stock, and the bok choy stalks. Put the lid on and allow to simmer for about four minutes, then add in the noodles and the bok choy leaves. Mix through, and allow to simmer until most of the liquid has been soaked up by the noodles. 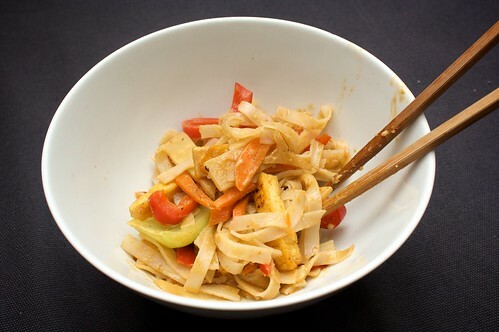 Serve topped with tofu. 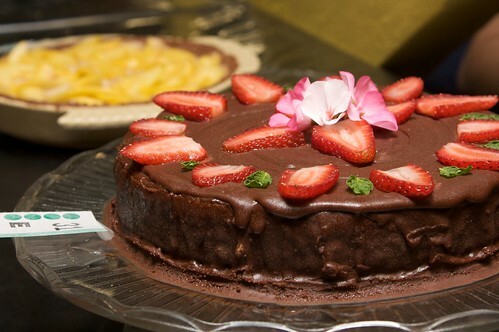 Saturday saw the Vegan Aduki Bakeoff at Kindness House! I wasn't able to attend until quite late, so Danni took my entries and entered them for me. I'll blog about my adventures and misadventures in pandan later, but I just wanted to quickly mention that Danni took a lot of pictures of delicious vegan baked goods, which you can see in full in our flickr! In the post Elitism and the Movement, Prof Susurro discusses the idea that veganism as a movement has played a role in perpetuating a classist discource. She interrogates this idea, which was a riff off a post at Vegans of Colour asking does second-hand figure into your ethics equation. Prof Susurro's point was that questions that position 'choice' as the key element imply that all vegans have this choice, ie, can afford to/have the ability to make this choice. Framing it in this way erases vegans who don't fit into a middle/upper class position. A lot of what I read around the blogosphere is about people making 'wrong' choices, and about how veganism is cheaper than other, animal-exploitative options, but statements whose base message is that fail to recognise that for some people, there is no option in there to choose. Anyway, Prof Susurro's post really got me thinking about the ways that I can a) enable people less privileged than me to be able to make a vegan choice if they want to, and b) make veganism more accessible. It's also got me thinking about the assumptions that I make, and how judge-y I can be as a vegan sometimes. Lots of thinking. It's an interesting post! I really recommend reading it, and the comments (though some of the comments get very deraily and defensive). And if you've never encountered intersections before, it's not a bad post in which to get an introduction. *an aside: I mostly know Malaysian and Chinese non-vegans! So if you have any Malaysian or Chinese vego buddies, please feel free to hook me up. After all that talk of nacho cheese dip, we finally made nachos and nacho cheese dip at the same time! It was basically the greatest. 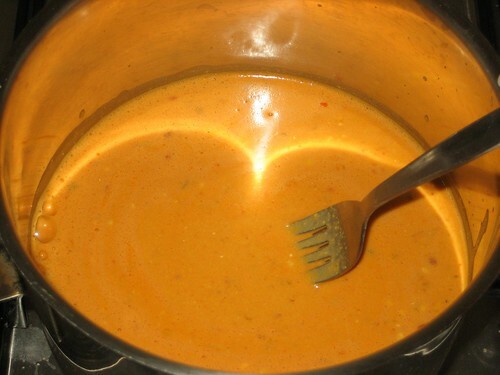 Making both the nacho sauce and the nacho cheese at the same time doesn't add anything to the cooking time, as the nacho cheese is easy to cook whilst simmering, but I would suggest perhaps making it in advance, otherwise the nacho cheese is a bit runny. But still delicious! I am really loving this nacho cheese dip. It goes with everything! In some oil, fry the onion, garlic, cumin, paprika, oregano, parsley, and tomato sauce. Don't let the spices burn! Fry until the onion softens, then add the tomatoes and kidney beans, and leave to simmer, lid on, for ten minutes. Then add the mushrooms, and simmer lid on for another six or seven minutes. Add the refried beans and allow to heat through, then serve, topped with delicious nacho cheese. One of my favourite things to eat is kaya. It's a coconut jam that is super common in Malaysia and Singapore (and under different names in other parts of SEA). 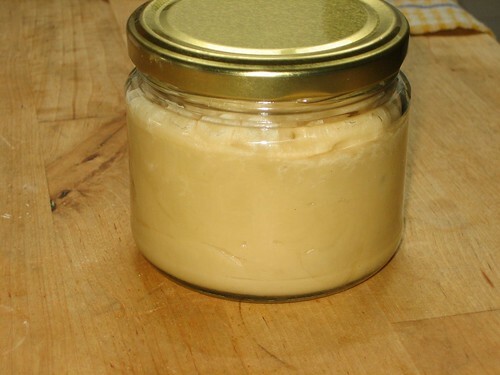 It's really great in breakfast bao, and spread on toast. It's really easy to find in shops, and it's cheap, which is good because it's time consuming to make. It's also chock full of eggs! So it has been my ambition for some time now to perfect a vegan kaya. And I will admit, I am not quite there! But I have been having some adventures along the way. I finally defrosted my pandan leaf. Asula claims someone in Melbourne sells them fresh, but doesn't know who or where. 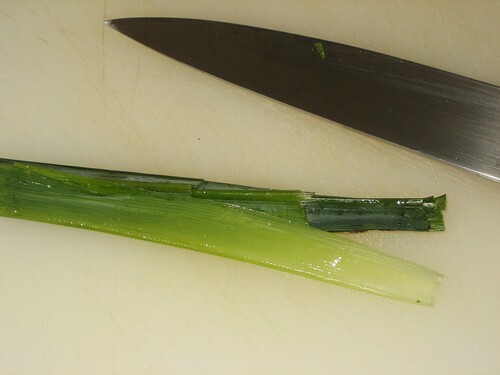 Does anyone know of any fresh pandan leaf for sale in the Melbourne metro area? I made some pandan juice, and was hit with the smell of freshly mown grass, which was a little off-putting! I whisked together a sort of eggy concoction, which is my trial and error section. I think I've got everything else down pat, it's just the working out what is a good egg replacement that is a problem! Then into the pot, eggy concoction, sugar, coconut milk, and pandan leaves! There was lots and lots of stirring, first over water and then, when I got bored, very carefully over direct heat. And then there was kaya! And then it SOLIDIFIED IN THE FRIDGE. Which, given it's a jam, means it didn't really work the way it should. Tasted good in the cupcakes I made later in the week, though! But not really spreadable. Further kaya updates as they occur, so stay tuned! I made a nacho cheese dip for the recent gluten-free cheese picnic. The nacho cheese dip was very tasty, and I made it again on Friday, because I had the genius idea that I was going to put it in pizza pin wheels to take to roller derby on Saturday. This recipe is super simple, and very versatile. I've modified it a little bit from the original recipe, so I reproduce it below, with pictures! Please note that I have followed the original recipe exactly before, and it works super fine. nacho cheese dip, originally from schmooed food. Take the stems off the peppers, but keep the seeds in. This adds a nice bite! You don't need to measure out everything in advance, but with this recipe I like to, to make sure I have everything I'm supposed to have. Then blend it all together! 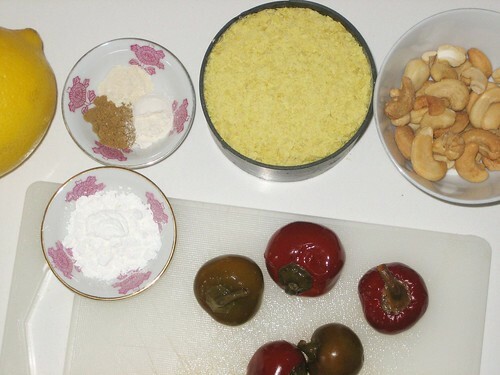 I like to blend the cashews first, to ensure that they're smooth, before adding the rest all at once. 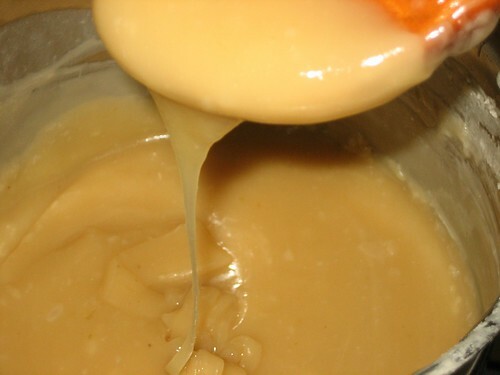 After blending, dump the whole mixture into a small saucepan and stir constantly over medium heat for about five minutes. I like to use a fork for this, but a wooden spoon would be okay also. 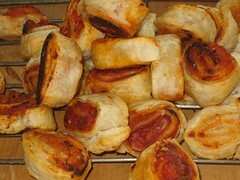 Vegan toasted cheese sandwiches, and pizza pinwheels! 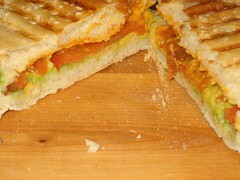 This was my first vegan cheese toasted sandwich attempt, and it was awesome! The cheese went perfectly - so perfectly in fact that I am thinking about making another lot of it this afternoon to keep in the fridge for emergency sandwiches during the week! After several weeks of eating at a lot of restaurants, I'm trying to do a similar thing to Jess, and eat mostly at home for the next little while. I started before Danni's parents even left, kneading the pizza dough as they loitered waiting for Danni to take them to the airport. But you have seen my standard pizzas before, so I don't really need to blog them! Tuesday I slacked off, and we had scrambled tofu for dinner (but I made it!). Wednesday I had the day off work, so I spent the afternoon experimenting with kaya, and then decided to cook a curry before I hurried out the door to my class. We have a lot of chillis growing on our balcony (it's awesome! 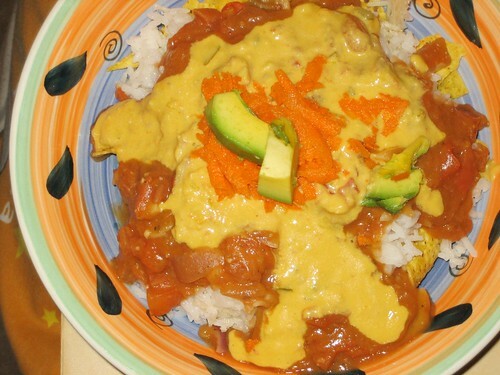 ), and the weather is growing colder, so I'm starting to cook a lot more curries. 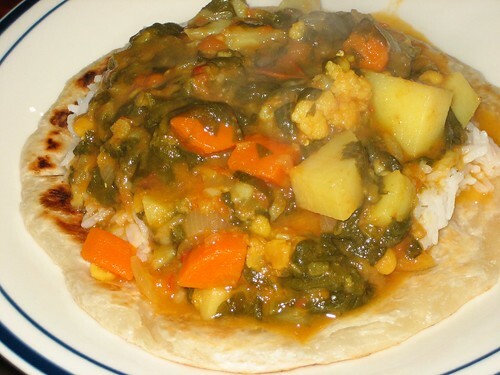 This is sort of based on the Sindhi vegetable and lentil curry in The Asian Vegan Kitchen (pg 23). I took the basic idea and then modified it to suit what I had and what I wanted. Rinse the lentils, then soak in a little hot water. Saute the onion (in some oil) with the cumin, turmeric, cayenne pepper and ground coriander, then add the ginger and garlic (both minced), as well as the chillis. Chillis should have been chopped, with their seeds. After the onion starts to soften, drain the lentils and add them, as well as the tomatoes, potatoes, carrot, cauliflower and spinach, preferably in that order. I like to let the tomatoes, potatoes and carrot cook for a couple of minutes before I add the cauliflower and spinach, but you may not! 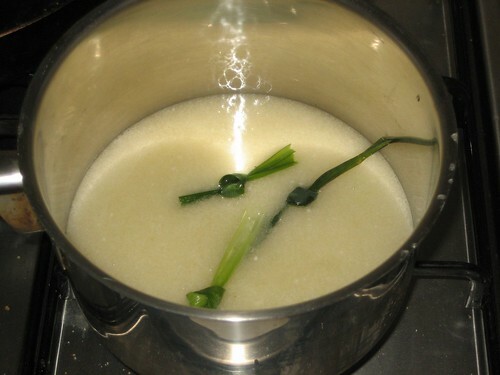 Add the stock and the water, and mix, then leave to simmer on medium to low, covered, for about 25 - 30 minutes. This is a tiny bit spicy! Also very liquidy, perfect for rice and roti. I have got to go to less restaurants for a bit! I know, I know. And I have stopped! In my defense, a) ate this two weeks ago, and b) am feeling a bit unwell so want to make an easy post! 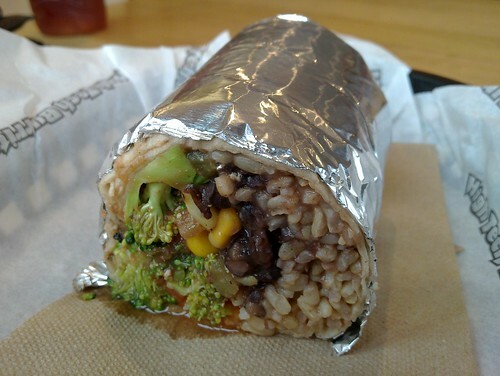 After you bookmark this post, and then try this burrito, you will thank me for it! High Tech Burrito is just down the road from my office! Usually I try to take leftovers for lunch, but after all the hanging with parents and stuff this wasn't really possible, so I went to High Tech Burrito. They have a range of things (mostly burritos), and you can mix and match and they know what vegan means! Tofu can be swapped in to replace any meat. Under pressure, I went for the California, which had lettuce, guacamole, pico de gallo, black beans, brown rice and salsa. It was delicious! It is a little bit of a hike from my office (ten minutes walk) but it is worth it. Will nom again! I am not sure about their gf status! 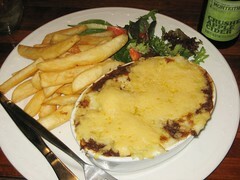 I've already blogged about the delicious lasagna at the vegie bar, but we ate at a few other places over the weekend! After the storm on Saturday, we didn't want to venture too far from home so we popped on over to the EBC. 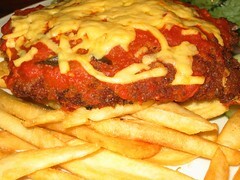 Trashy and familiar, I elected to eat the classic vegan parma at the EBC. Danni went for the shepherd's pie (TVP and potatoes and vegan cheese, I think) from the specials board. This was really tasty! 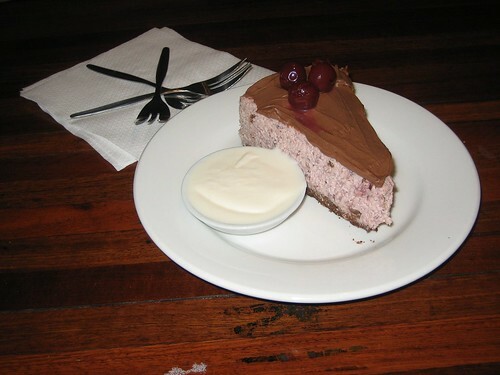 We shared a cherry ripe cheesecake. Who could go past such a delight? I know several people have had some terrible service at the EBC lately, but Saturday night our service was prompt and friendly, some of the bar staff were even cheerful! Maybe it was the weather? Went to Shakahari, had the Kali Tunis, which was delicious (oh Malaysian curries, I love you), light but with a chilli bite that didn't hit until after. I know it's hard to see, but it's at the back of the photo! Oh, composition! My strawberry daiquiri was a bit light on with the alcohol, but my mango crumble was delicious, and Danni's highlight of the meal. Also went to Lord of the Fries (Melbourne Central), I have got to stop ordering a burger and sharing a box of chips just with Danni, it is too much delicious trashy food, and I feel uncomfortable for ages. Failed to get a seat at A Minor Place, this is what happens when you try to do brunch on a public holiday in Brunswick. Meal lowlight of the weekend: going to Sugardough with J and dB just before Danni's family arrived, and the vegan cake sitting there on display, but not being allowed to eat it. Just cut the cake for me! LET ME EAT IT, SUGAR DOUGH. We actually considered buying the whole cake, and in hindsight, probably should have. Because they're DELICIOUS. I've been to Vegie Bar three times in the last fortnight! This is more than I ever have previously! The first visit was because I was working in the area, and feeling a little unwell I had their soup of the day. 12pm on a Wednesday afternoon, the service was good and it was kind of quiet, and the pumpkin soup was just what I needed to get through the day. No photos, but thanks for the soup. The second visit was with T, who met me after my FOE shift last week to borrow a book and to hang. 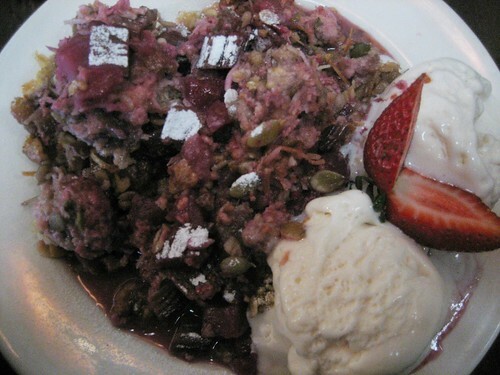 We wandered in to Vegie Bar because I knew there'd be desserts I could eat, and it was close by. This crumble was lovely! Not the greatest crumble ever, and a bit runnier than I like my crumbles, but the rhubarb was tart and it was quite nice. Let me describe this piece of magnificence for you. 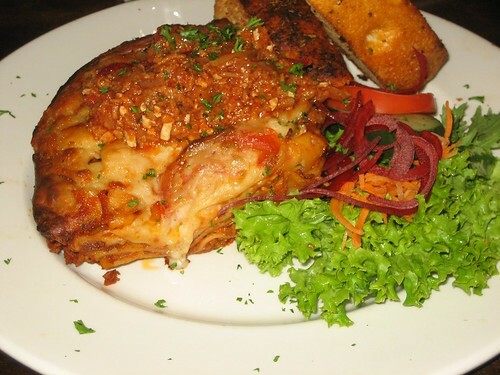 This vegan lasagna (at only $12 from the specials board) featured seitan and smoked tofu bolognaise (OMG), with a bechamel sauce, and was covered in vegan cheese and more of the bolognaise. It was served with a light, crisp garlic bread, and a fairly average garden salad. But this lasagna was amazing. The best I've eaten in an absolute age. I would eat it again tomorrow, definitely. 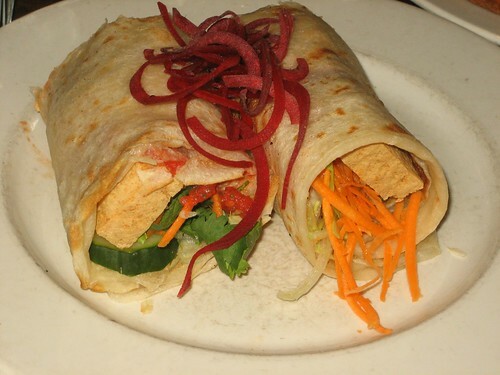 Danni ordered the tofu wrap, and she was totally jealous of my lunch, though she says hers was perfectly fine. Fine but not AMAZING WOW. Don't fear! I'm not suddenly in love with the Vegie Bar. But it was good. Maybe I think more highly of it than I used to. 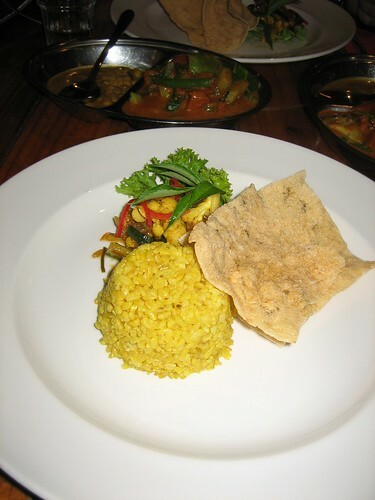 Previous visit to Vegie Bar here. I keep forgetting to blog about our most recent visit to Plush Pizza! This was Tuesday last week, after my parents and my sister went back to Perth. I was not feeling well, and considered suggesting that some errant family member had left me with a cold! So anyway, as I wasn't feeling very well we only shared one large and one small pizza between the three of us. We picked the primavera pizza for the large, and (OF COURSE) the garlic for the small. The primavera was okay, but nothing special. 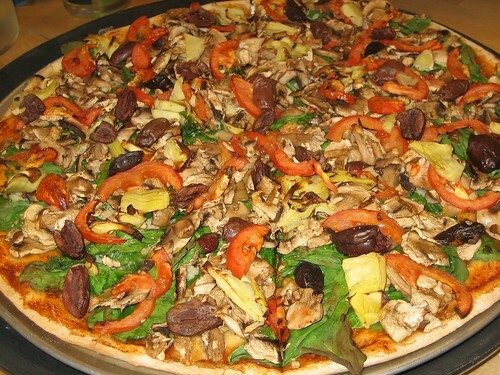 A perfectly servicable pizza, but if I'm going to go to a vegetarian pizza place I don't really want pizza that I can get at any old pizza place. Still want to try the chunky and the aztec. And some other things. The foods we eat at Chinese New Year are important: there is a symbolism there, we don't just eat them for tradition, we eat them because of superstition. That's not to deny that custom is involved, because it is, but its primary function is symbolic in nature. We eat fish(鱼), for prosperity, and abundance. We eat chicken(鸡), for happiness. We eat noodles to bring us a long life. We give oranges as a symbol that we wish our friends to be wealthy. We eat peanuts for long life. We share these dishes, passing them back and cross the table, dipping in with our chopsticks, to indicate that we wish these things for one another, that we want to share these things with our loved ones. This is part of the reason why the hardest part about my veganism for my mother was not veganising foods, but coming to terms with the fact that we could no longer share in this way during Chinese New Year. And this is why mock meats exist, you know, for exactly this reason. Yesterday was the last day of Chinese New Year, so Em and Jo joined us at Enlighted Cuisine for one last CNY noodle sharing. The table across from us had yee sang, and oh I considered it for half a second, but put it aside for next year - next year we'll go to EC for yee sang, and lo hei it all up. We ordered the lemon chicken, and we ordered an assam fish (the fish was deliciousness, though could have done with more sauce). Of course (of course) we ordered noodles, Em and I would have it no other way. 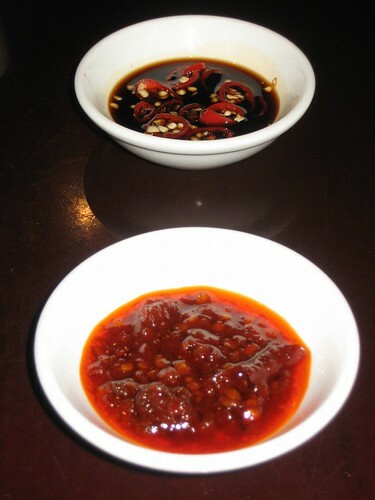 We ordered some gailan, which was beautifully gingery, and we loaded up with chillis, both fresh and otherwise, which were tangy and spicy (in the case of the sambal, very spicy). I wanted yee mee, but we went for the mee goreng, which was gently flavoured with curry powder (my favourite way of serving mee goreng). EC was full of people doing both 15th day of the month stuff, and last day of CNY stuff, and it was nice. Sad it was so cold!